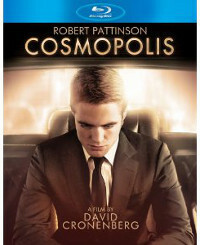 Cosmopolis (eOne) is a microcosm of a disconnected existence, life lived in a bubble in financial dealings and digital communications and brief face-to-face conversations and sexual intermissions in a space shuttle of a limousine creeping through the gridlock of an anonymous New York City. David Cronenberg adapts Don Delillo’s massive novel, distilling it down to a two-hour odyssey through a long day of digressive debates and ruminations as the grand gamble by financial kingpin Eric Packer (Robert Pattinson, perfectly disaffected in a mix of boredom and anxiety) turns against him, pulling down his empire with it. But inside the bubble, the ruin is no more real than the words swapped in dialogues the devolve into parallel monologues and indecipherable symbols flashing across the screens of his moving office. Cronenberg is in fact the perfect director to bring this book to the screen. He turns this day in the urban jungle into an unreal window on an alienated world, where civilization pitches on the verge of ruin and Packer, dissatisfied with its pace, nudges it along, taking the motto “destruction is a creative act” to heart. Warner Home Video releases a quartet of DVD debuts, all with troubled critical histories: loved by some, disliked by many, largely ignored by most. And that’s what makes their arrivals so interesting: it gives us a chance, an excuse even, to revisit the films. That said, I’m up to my eyeballs in the Seattle International Film Festival and thus only had time to see one of them, but it was a revelation. David Cronenberg’s M Butterfly was largely misunderstood or, worse yet, dismissed by most critics when it was released in 1993. The coolly dispassionate screen adaptation of the David Henry Hwang’s Broadway play, itself based on a true story, is in the same key as Cronenberg’s Crash and A History of Violence, and explores the same issues of identity, sexuality and self-definition that he’s been exploring all his career. But in 1993, coming in the wake of The Crying Game and Farewell My Concubine, this elegantly directed period film struck critics as wrong-footed. Jeremy Irons’ RenÃ© Gallimard, a French diplomat in 1964 Peking, falls in love with Chinese Opera star Song Liling (John Lone), who becomes his fantasy of the submissive Asian woman, as much RenÃ©’s creation as Song’s. Because, of course, Song is a man. It’s not only obvious to us but to everyone around RenÃ© that Song is a man (if not as it plays out, then in retrospect – the odd looks RenÃ© gets as he comes backstage at the Chinese Opera to see Song and the disgust on the face of Song’s servant as RenÃ© visits Song’s home are not for Song but for RenÃ©). His mistake is not a misreading of the culture â€“ that would require some knowledge of it â€“ but a complete ignorance of it.Â Anyone who knows anything about Chinese Opera understands that the female parts areÂ all played by men, as least before the Cultural Revolution put an end to all such decadent and chauvinistic practices. There’s plenty of evidence that RenÃ© sees only what he wishes to in the Chinese culture, from the trap that he and his wife fall in to accepting all the western assumptions of Chinese clichÃ©s to his disastrous predictions of the Chinese response to American policy in Vietnam. Just like the opera that gives the film its name (and the name that RenÃ© gives Song: Butterfly), it’s a western fantasy of idealized, self-sacrificing Asian submitting to the power of the west with demure grace and romanticized tragedy. In other words (Song’s words specifically), another example of imperialist arrogance in a foreign land. 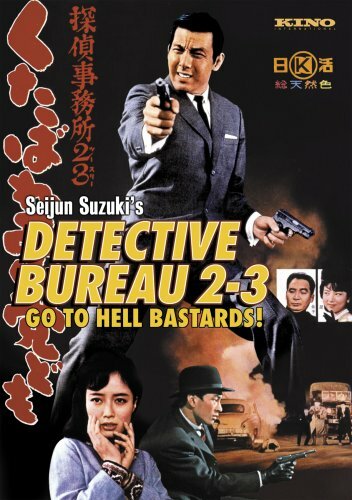 It may not be the best film of the week but this early Seijun Suzuki yakuza potboiler certainly sports the greatest title I’ve seen flash across my flatscreen all year: Detective Bureau 2-3: Go To Hell Bastards! The film, starring a cocky and cool Jo Shishido as a private detective (with a side job publishing a scandal rag) who hires himself out as an undercover agent to infiltrate a new gang in town for the local cops, is pure B-movie silliness and Suzuki knows it, plays with it, flaunts it. From the pre-credits sequence, where a gun sale (with weapons sold right off an American army base) turns into guns-a-blasting ambush by a rival gang that launches their assault from a Pepsi-Cola delivery truck that barrels through the swap like a tank, to the return engagement gang war that ends the film, this is all about turning a junky crime script into a blast of energy set against a backdrop of candy-colored sets and kitschy nightclub numbers and set to a score of growling pop music. With his greased-back hair, dark glasses and pock-marked chubby cheeks, Jo Shishido hardly looks like a matinee idol but he pulls it off with sheer bravado. Shishido’s flippant attitude never falters, whether he’s talking his way into a job for the cops or ingratiating himself with a suspicious mob boss. When a nightclub singer almost blows his cover, he jumps into a duet to play for time. When his backstory (thrown together is rush of improvising) finally unravels, he doesn’t even flinch. He just offers a new service: playing double agent for the mysterious big boss. Suzuki directs it all with tongue-in-cheek attitude, not so much making fun of it as making it fun, playing out the by-the-number twists with bright, bubbly enthusiasm and devil may care energy. His later gangster movie parodies take on a genuinely genre-busting stylistic insanity. Here he’s content to just play up the conventions with a cheery self-awareness and the energy of a New Wave genre celebration. Kino’s widescreen disc preserves all that color with a bright, crisp clarity.